The recent downturn in coal mining has slowed its spread, but mountaintop removal mining has already reached across the coalfields over the past 30 years. 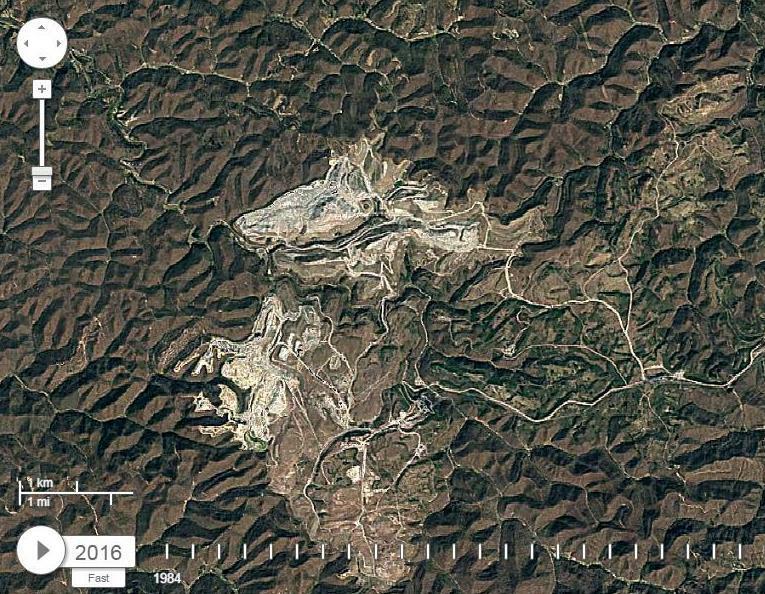 Using a Google app called Timelapse, you can observe the changes in the central Appalachian coalfields, especially southern West Virginia and eastern Kentucky. And here's a close-up of the Hobet Mine in Boone and Lincoln Counties, W.Va.
Hobet mine in Lincoln and Boone Counties, W.Va.
On West Virginia Morning, the National Academy of Sciences is beginning a comprehensive study to see if mountain top removal coal mining affects the health of residents who live near them. The story on West Virginia Morning from West Virginia Public Broadcasting – telling West Virginia’s story. A $6 million settlement has been reached in federal court that will restore damage from West Virginia mountaintop removal mines. The Sierra Club, Ohio Valley Environmental Coalition and West Virginia Highlands Conservancy announced the settlement with the Virginia Conservation Legacy Fund. A consent decree was entered Friday in U.S. District Court in Huntington. The federal Office of Surface Mining Reclamation and Enforcement announced it will fund a million dollar review of current research on links between surface coal mining and human health risks. The announcement came more than a year after the West Virginia Department of Environmental Protection formally requested the review.